From 'Purple Rain' to impressionism, this month we take a look at how art celebrates the beauty of some classic British weather. January isn't exactly famous for its sunny skies, so what better time to throw a positive and artistic light on our winter elements? The impressionist painters of the 19th century were also known for celebrating wet weather in their art. A large part of impressionism is about capturing the ever-changing light and atmosphere in a painting. For example, Renoir's beautiful sunny afternoon pieces and Claude Monet's dreamy botanical landscapes. But there are some famous pieces that depict less than ideal weather conditions for painting en plein air, as the impressioists did. Although it may not seemlike the typical style of impressionist paintings with its almost 3D-like quality, 'Paris Street; Rainy Day' shows a very real atmosphere in the way the rain is painted, shimmering on the cobbled streets. Vincent Van Gogh was a huge fan of Japanese art, so much so that he created his own paintings in the same style. 'Bridge in the Rain' is actually Van Gogh's painted copy of the original print by the Japanese artist, Utagawa Hiroshige. Although the dimensions were kept the same, Van Gogh has added his signature textured brush strokes and vibrant colour to the piece to make it his own. Edgar Degas, one of the founding fathers of impressionim, is famous for his equine art and portraits of ballet dancers. Here we see the jockeys and their horses in the rain but in the rain. Degas painted many scenes of jockeys and horses, but not many in the rain. Degas's classic delicate strokes and depiction of the light creates the impression of soft and heavy rain. Unlike the dreamy landscapes of river on sunny afternoons, Claude Monet's 'Morning on the Seine In The Rain' depicts the busy surface of the river as rain drops hit it. The blend of the same colours from the sky and the trees into the river create the impression of a downpour and a very wet morning. Evening City Rain celebrates the atmposheric scene of a rainy evening. The very realistic rain drops in the forground create the illusion of looking out at the painting through a window onto the rainy street. Stephen Casey creates the feeling of falling rain in the large, vertical brush strokes that make up the background of the piece. Olena Topliss has created a very dramatic skyscape achieving photorealism with her dabbed, soft clouds. Playing with light in a way that would make any impressionist proud, this piece is very atmospheric and really captures the beauty of a rainy landscape. 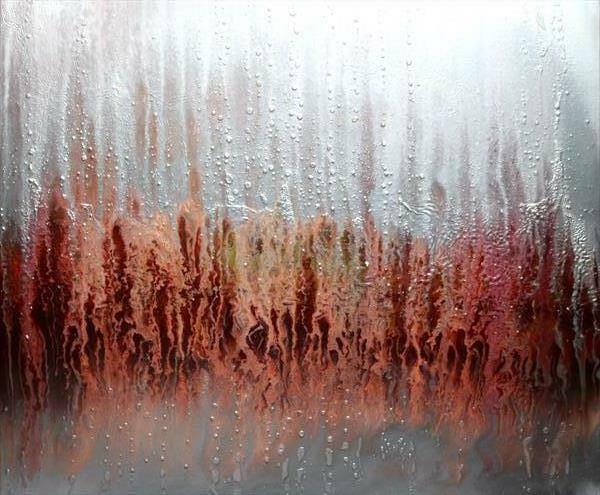 Robert Jackson's abstract is a very tangible piece portraying condensation, water droplets and the suggestion of an autumn landscape in the background. 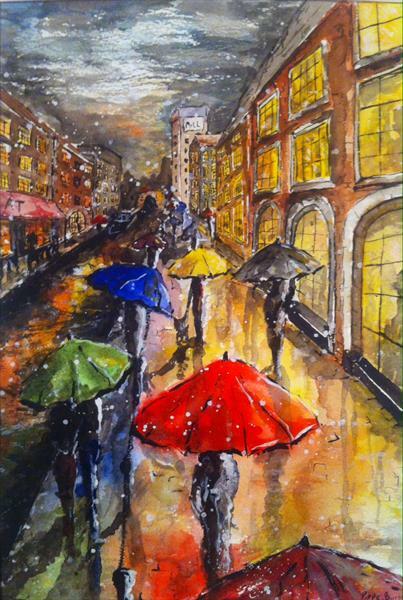 A watercolour scene reminiscent of Caillebotte, Pippa Buist has created a classic city street scene in the rain. The light reflected on the wet pavements and water of the canal really gives the viewer the beautiful impression of a very wet day. Yary Dluchos's oil painting on canvas has bold strokes and palette knife strokes that catch the constantly changing atmosphere in a scene that impressionism also captures. 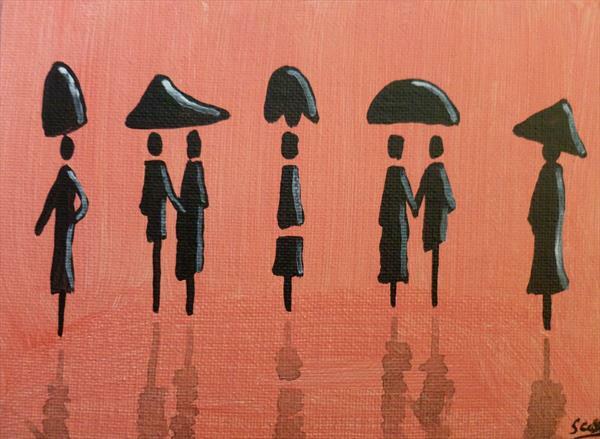 The drips trickling down the canvas in a background layer gives the sensation of drizzly weather, combined with downward strokes emulate falling rain. A subject can be beautiful to observe and paint whether it is a wide open landscape or a very small detail. 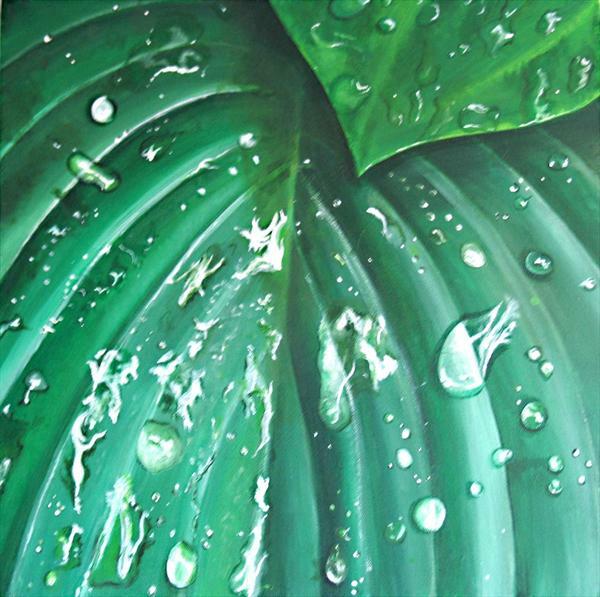 'Raindrops On Hosta Leaves' is a great photorealist acrylic painting that captures the small but beautiful detail of raindrops on a leaf. London is always a great muse: full of drama, interesting scenes, and a never ending opportunity to people-watch. 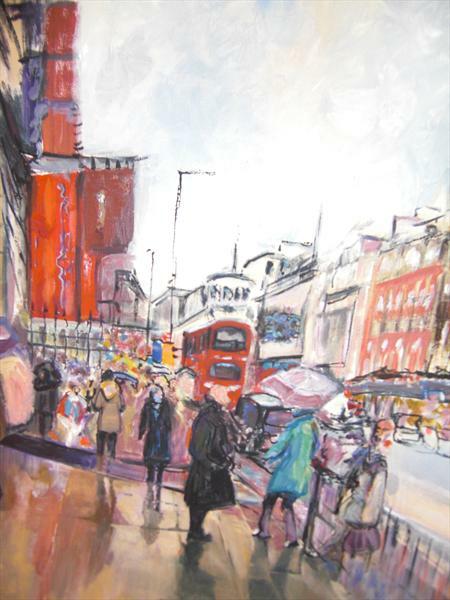 Lesley Blackburn has captured the hustle and bustle of a busy London street in the rain wit her oil on canvas painting. 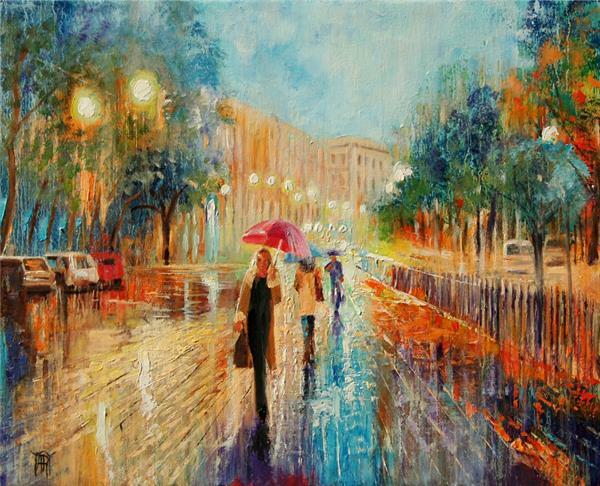 The wet, reflective pavement in the foreground really catches the eye and sets the rainy scene from a firest glance. 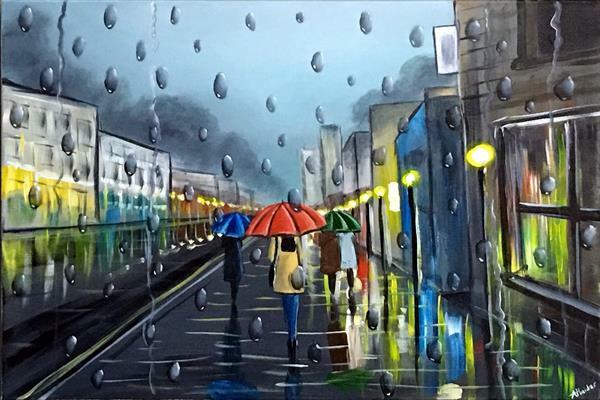 Find more paintings, illustrations and drawings on our gallery that either depict the rain or distract you from it on our online gallery.